Street food is a multidimensional gift for the budget traveller. Yes it’s cheap, and when you’re on the road for a while it helps to make every dollar stretch, but street food is one of those rare commodities where spending less almost always yields more. Prepared right in front of your eyes and served hot off the grill, street food is fresh and minimally processed. In most cultures, lean-to roadside kitchens are designed to feed locals, not tourists, so the dishes are a genuine taste of the indigenous cuisine. And let’s not forget the sheer sensory delight of snacking from a hawker or market stall. When you eat on the street, you’re deep in a place, all the sights and sounds and smell of it. 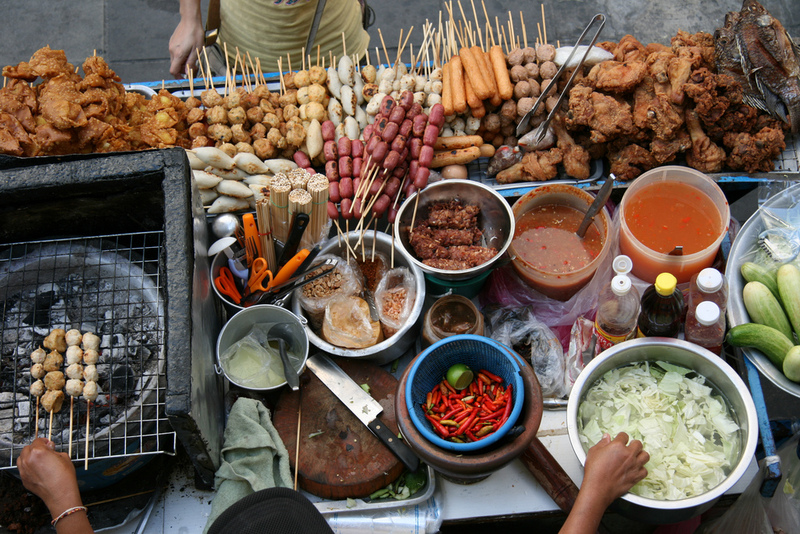 Eating street food is one of the best ways to get to know a city. Korean food has it’s very own style of hot and spice, and you can find your preferred brand of barbecue in many a roadside restaurant tent. But the true guilty pleasure of the Seoul street food scene is the twigi or deep fried snacks. Pass by a trestle table piled high with golden shapes and nab yourself a lucky dip culinary delight. You could get a deep-friend egg, some deep-fried squid or a fried vegetable pancake. The deep fried peppers are particularly good. Tteokbokki (spicy rice cakes) are also very popular, if you can get past their slithery appearance and super-hot force field of red pepper sauce. Although it originated in the north, pho is ubiquitous Ho Chi Min City. The beloved beef noodle soup is on the boil on most street corners of the frenetic Vietnamese capital, alongside banh mi stalls whipping up fresh, crunchy, chilli-flaked pork and coriander rolls. And that’s just the tip of the foodie delights – you can feast like a king of sour soups, rice flour omelettes and barbecued seafood at heavenly roadside shacks across the city. Tokyo makes the list for next level convenience and a food culture so idiosyncratic it will blow your mind. Jidohanbaiki (vending machines) in the Japanese capital dispense everything from cold beer to corn soup, fresh vegetables to hot pizza. And for those of you wanting to recapture the heady days of first year uni, there are plenty of machines that deal exclusively in plastic cups filled with hot instant noodles. Thai cuisine has to be the world’s best, right? There are other contenders, but the distinctive blend of sweet, sour and spicy really lights up your mouth and you don’t have to go five star dining to find it. Bangkok’s back alleys are teaming with street food vendors who get by with a plastic table top and a mobile grill, which is about all they need. Don’t expect a high quality Pad Thai on the street, but prepare to drown in all manner of freshly barbecued meat and fish, vats of Thai curry and sour soup, and a weird assortment of fermented sweets (which don’t necessarily taste great, but come with high novelty factor). Pull up a plastic chair and tuck into a basil-specked stirfry, but go easy on the chilli. The Thai version of hot ‘n’ spicy is more than you can handle, trust us. The food truck scene is a worldwide phenomenon – wherever there be hipsters, there be trucks – but there are a couple of places where you can’t kick a pebble without hitting a mobile eatery. Austin, Texas during SXSW has got to be the best. Along with hundreds of thousands of music fans, food trucks flood the city and set up shop in vacant lots, like a series of mini food truck carnivals. The variety is dazzling, with everything from artisanal sandwiches to juicy tacos, cupcakes to funnel cakes and bacon-crusted donuts. But the must eat item is Texas barbecue – brisket with smokey brown sauce on the side. Jamaa el Fna is the huge public square in the heart of Marrakech’s medina quarter, the historic heart of the city, and at night it transforms into a bustling food market. Blending North African spices with Southern European freshness, the market heaves with grilled meats, delectable dips and chunky tomato soups, and flaky loaves of bread. Try the bessara (broad bean soup) or the brochettes (chicken kebabs) but make sure you follow the locals when deciding where to dine. The UK doesn’t get much play when it comes to street food, but a good English market lays the bounty of the English countryside at your feet, and London’s Borough Market is the best. In a sprawling hive just around the corner from London Bridge you’ll find a bell-ringing foodies delight filled with fresh preserves and produce, and a host of takeaway food options. Get in early for a roast pork roll, fresh off the spit, or the world’s best Cornish pasties, or just wander around sampling hard and soft cheeses, fresh from pastoral idyll to plate. Food in general in Turkey is out of this world, full of fresh meat, vegetables and whopping big flavour. The nation’s capital is dotted with street-side markets and lean-to eateries, serving grilled corn, pickled veg and fish fresh from the Sea of Marmara. Start with the glistening doner kebab and the flaky folds of borek pastries, but make sure you hit the fish markets and sample a fish sandwich. Brave the çiğ köfte (raw meatballs) and you’ll discover a spice-laden flavour bomb that is one of a kind in this world. Laksa! Hawker stands in Singapore dish up hot soups, dumplings and Hokkien noodles made with love, but the laksa is the knockout dish. The spicy coconut noodle soup is one of the most distinctive Asian flavours, sweet and sour and savoury, and readily available from hawker restaurants all across the city. Singapore is an orderly place, so you don’t find street food on the street so much, but the hawker food centres are easy to find and the rough and tumble of those indoor food markets is always pretty invigorating. Corn flour and spice dominate the streets in the sprawling megopolis of Mexico City, home to the best roadside eats in the world. From starchy, leaf-rapped breakfast tamales (the Mexican hot pocket) to elote (cheesy corn on the cob) to the glorious pork-filled tacos al pastor, the burritos and carnitas, you can eat like a king for virtual pennies if you just follow your nose. Treat your taste buds. Let Qantas take you on your next foodie adventure.